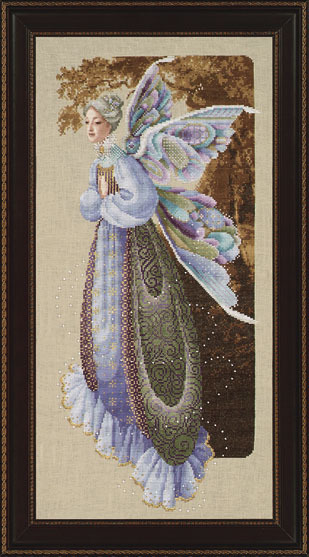 Fairy Grandmother is my image of a woodland fairy emerging from the forest. Her brocaded gown and mystically patterned wings are done in lavenders, robin-egg blue and periwinkle... with a touch of tiny pearls surrounding her neckline and scatters of elfin gold she floats before the amber trees. Her hair is done in lovely shades of snowy gray but can be easily changed to darker tones for the younger fairy. She was designed for my grandchildren who live far away... since my spirit watches over them and magic kisses must take the place of real ones. 8 3/4" x 18 3/4"
Copyright © 1997 Marilyn Leavitt-Imblum. All rights reserved.